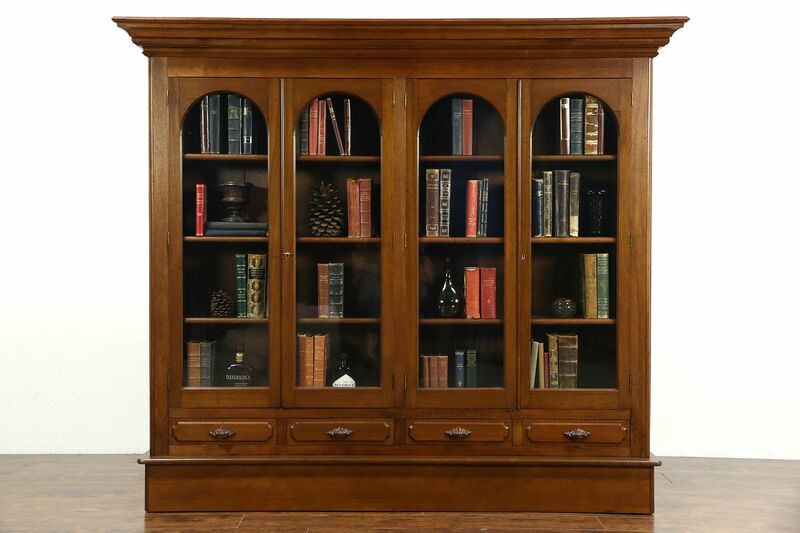 A Victorian period bookcase from about 1860 is solid walnut with arched wavy glass doors. The restored finish is in excellent condition on this American made furniture. There are shrinkage separations from age for antique character. Deep moldings and crown are well proportioned. Two separate banks of shelves adjust on wooden supports. Door locks work with a key. Lower drawers have hand cut dovetail joints, square cut nail heads are visible. The separate base is rebuilt. Measurements are 6' 10" wide, 14" deep and 6' tall.